Today I want to show you a few more examples of pinching out or slashing and spreading fabric on a toile and transferring those changes to the paper pattern. 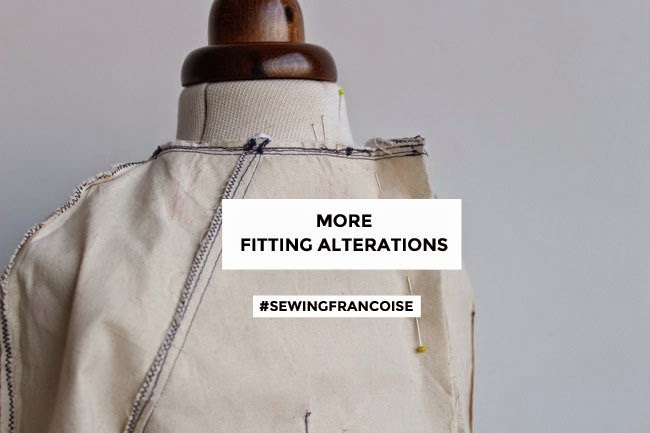 Fitting is a huge topic and this list is by no means comprehensive - but I hope that it will give you a general understanding of the principle of adding and removing fullness which you can use on the particular area that you need to alter. If you do need more help, I'm going to link to some further resources at the end of this post, written by people with much broader knowledge of the subject than me. Don't feel overwhelmed though, you really don't have to read a fitting book cover to cover in order to make something that fits you - you probably only need to make a handful of tweaks to a sewing pattern for your own fitting issues, and once you know what they are it'll become easier and easier for you to make these changes as you sew more things. Hooray! One of the versions of the Francoise dress features two-piece raglan sleeves. 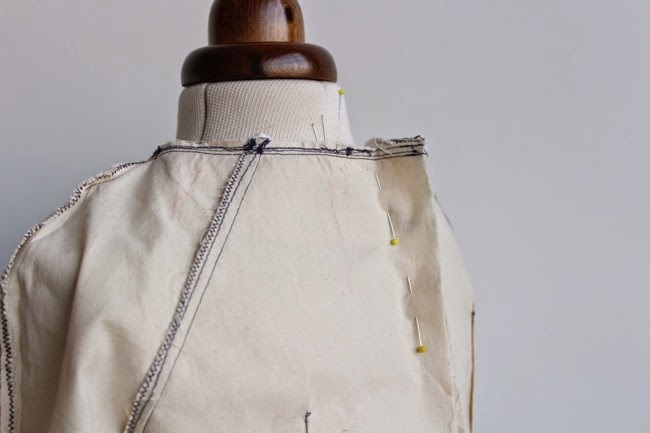 Since our shoulders are different shapes, you may find that you need to alter the shape of the curve of the shoulder seam that joins the front and back sleeve pieces at the front. (The two-piece shoulder seam is designed to sit 1cm forward of the centre of your shoulder so you can see the style line from the front.) 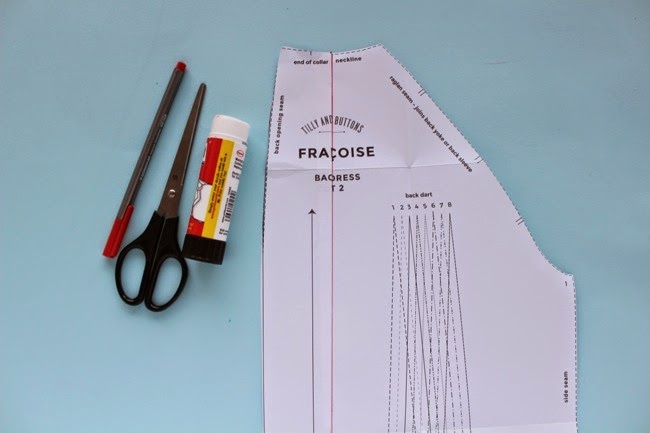 Repin the shoulder curve into a shape that fits you (you may need to unstitch the toile if you need to add fullness here), then draw your new shoulder seam shape onto the paper pattern - on both front and back sleeve pieces. 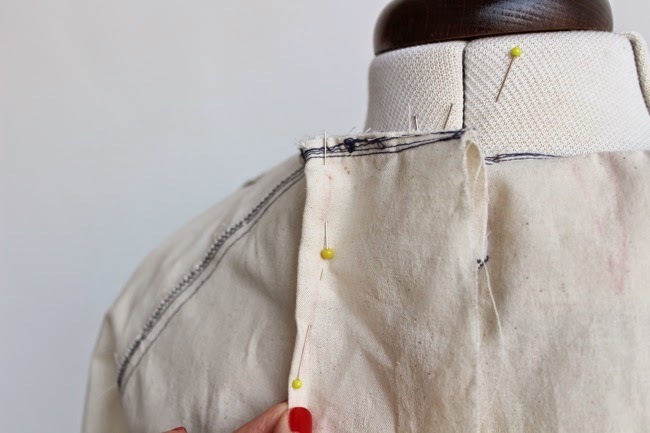 Measure the seams on the front and back sleeves from the neckline to the first notch to check they are the same length, and adjust if you need to. 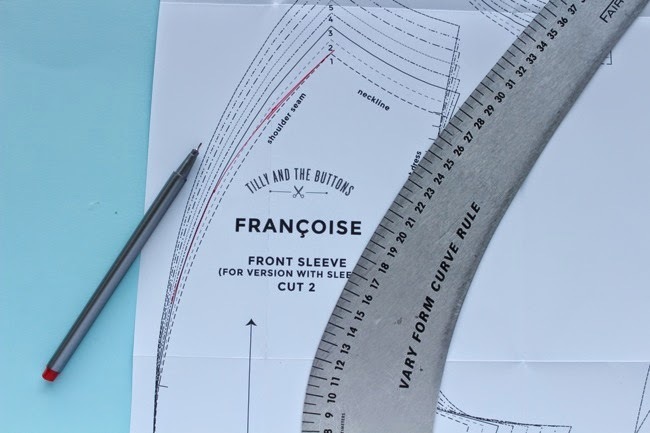 You can make a similar alteration if you need to add or subtract fullness at the raglan seam lines. You can also add or subtract fullness horizontally. For example, if you find you have excess - or not enough - fabric at the shoulder on the sleeves, you can pinch some it out or slash and spread it on the toile. 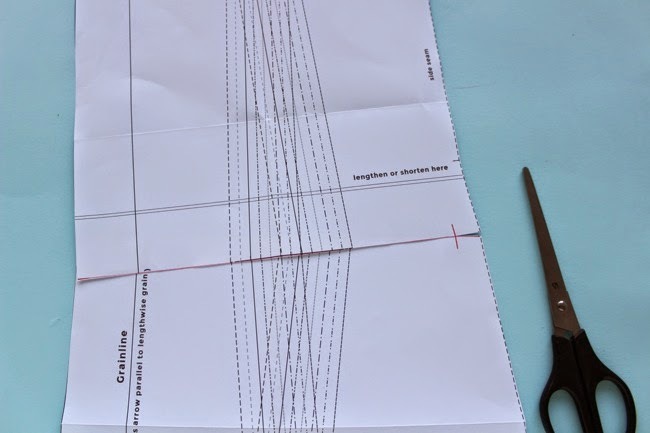 Then draw a cutting line in the same place on the paper pattern, marking the stitching line 15mm / 5/8in from the raglan seam line. Cut from each end of the line to this point, leaving a teeny bit of paper intact as a hinge. 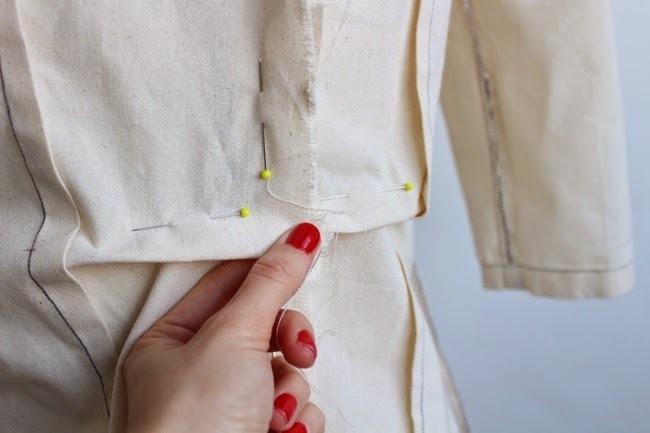 Slash open the shoulder seam side if you need extra space, or overlap the pieces if you are removing it. Glue or tape in place (with a new bit of paper under the gap if you've spread it open), and redraw the shoulder seam. 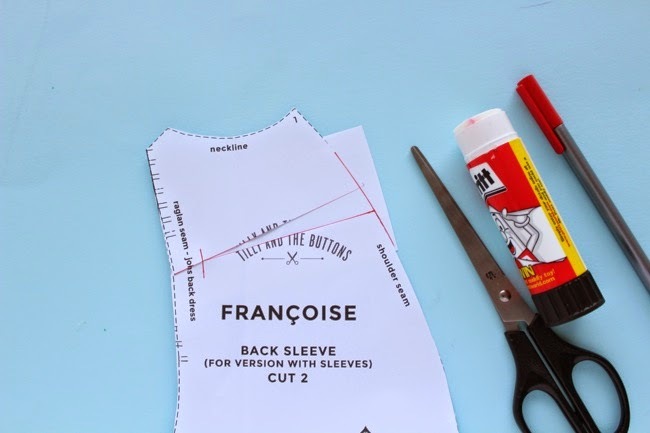 Do the same on the front and back sleeve so that the shoulder seams end up the same length. If your lower back curves inwards more than most, you may find you have some excess fabric pooling itself horizontally around that area. Pinch out a wedge of fabric where you need to. Mark a cutting line in the same place on the paper pattern, and mark the stitching line 15mm / 5/8in in from the side seam. Cut from each end of the line to this point, leaving a teeny bit of paper intact as a hinge. Overlap the pieces at the centre back seam by the amount you removed from the toile. Glue or tape in place and redraw in smooth seam lines. Redraw the back waist dart. 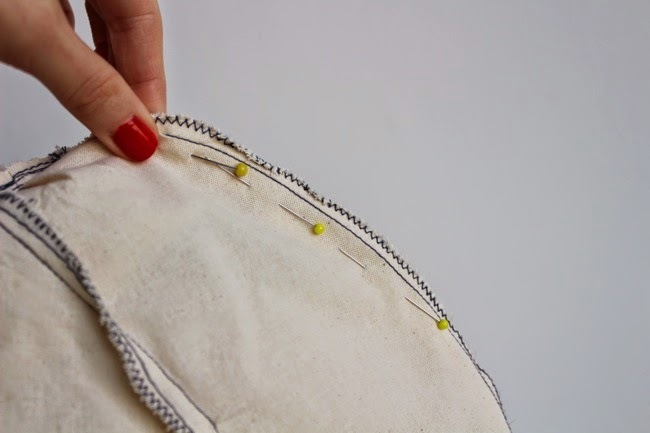 If you tried that and found that actually the excess fabric falls around the middle of the back neckline, then that's where you want to pinch out a wedge of fabric. Measure how much you pinched out, then draw a dart the same size and in the same position on the paper pattern. If you are happy to sew a dart here on your real dress, then "true" the dart the same way as we did when we moved the bust dart. If you'd rather not have a dart here, I get you. What you can do instead is draw a long wedge from the top of each dart leg to the bottom of the pattern (or to the waistline). Cut up one of the lines of the wedge, overlap the pieces at the lines and stick them down. 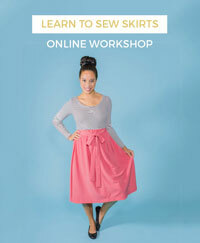 Redraw smooth seam lines at the neckline, centre back and hemline if you need to. 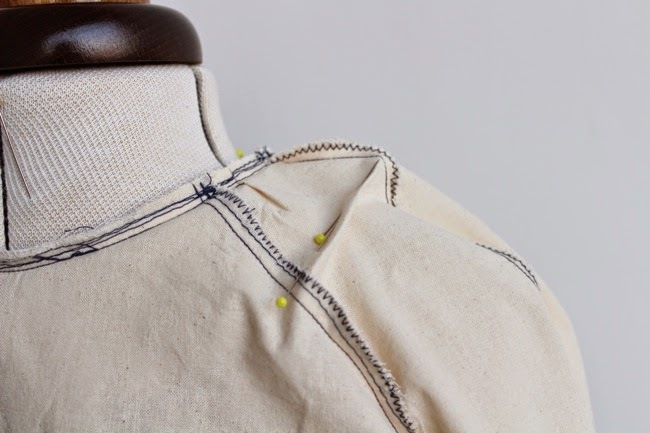 If you change the neckline, don't forget to add or subtract the same amount of fullness to or from the neckline facings and the collar if you're making it. The Internet! 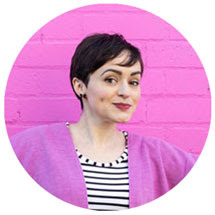 - seriously, there is so many great tutorials online so if you google the fitting issue you're having you will probably find the answer you're looking for! 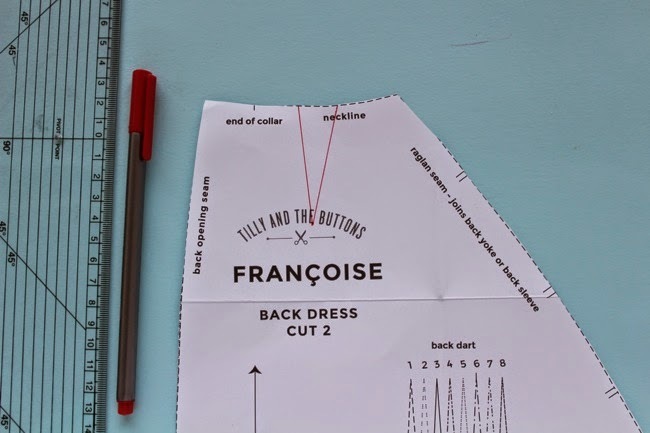 Next week, we're going to cut out our Francoise dresses and then get sewing. I'm so excited to see what you make! Have you chosen your fabric yet? What did you pick? Tell me, tell me!